We neglected going to the beach all summer (break) long and just had to sneak a trip in before things get really hectic for Andrew (who just finished his reading list for his comprehensive exam this evening, hallelujah—102 items: 32 books and 68 articles), so on Saturday morning we met up with some friends and drove out to Topsail. It's really is simply the best beach to go to around here. And by around here I mean it's like a three-hour drive. But it's so worth it. We had a perfect day at the beach. When we first arrived there was an ominous black cloud lurking behind us but the wind was in our favour and blew that cloud to storm on someone else's parade while we got to enjoy a perfectly balmy afternoon. The kids couldn't wait to get in the water. The tide was out super far again, leaving a shallow pool of warm water for the kids to splash in, which they all loved but which Benjamin loved in particular. He welcomed the sea with open arms. And then he jumped up in the air and landed square on his behind more times than I could count, making terrific splashes and hollering happy—and completely nonsensical—things. Meanwhile, his sisters were off playing with their friends—who have very similar tastes in clothes! This is a picture of Rachel with L. (not Miriam). They have the exact same swim suit! When they were sick of whatever game they had going on before they spent several minutes running between what they dubbed "the cold water" and "the warm water." Miriam's first shot at boogie boarding solo was a bit of a catastrophe. She fell off the board and got pummeled by the waves until Daddy rescued her. Then she sat on the beach and sulked and I wasn't sure she would ever pluck up enough courage to try again. But then we found a sea flea, and that diverting enough to make her forget that she "even did swallow some ocean." And then we had some lunch—a feast fit for kings (peanut butter and jelly and sand sandwiches). His lunch was a little different than ours but he seemed to enjoy it heartily and I certainly enjoyed taking my turn watching him! After lunch the kids played in the sand and the "warm water..."
...and frolicked in the "cold water." And when the frolicking gave way to bodysurfing, I knew that Miriam had recovered from her first failed attempted at boogie boarding. Oh, and she found a shell! The waves were about as ferocious as we've ever seen them at Topsail and bodysurfing was getting rather nerve-wracking for me (and all I was doing was supervising). The girls were being swept off their feet constantly and thrown into triple-backward-summersaults. Benjamin was not as much of a fan of the waves. "No. Stop. All done!" he kept telling us. In his defense, these waves were monstrous. Andrew and I both agree that we've never had more fun boogie boarding in our lives. The waves were tall and fast and glorious. We'd be pulled up in six-foot swells and then would shoot over the crest, plummet into the white water, and zoom into shore. My girls could not stay out of the waves. But my little man wanted nothing to do with them. "Miriam," I said. "You've been so brave in the waves today. I bet you could boogie board now, no problem!" She must have agreed with me because she ran up to our stuff, found her boogie board, and marched back to the ocean. It was clear from her body language that she meant serious business. She joined Andrew and Rachel in the water and did amazingly well for a four-year-old. She had quite an audience cooing over her by the time she was finished. We spent hours in the ocean, which was quite tepid for being "the cold water." I think we all have sand-burns on our knees from sliding onto shore. We spent a long time doing dry-land activities, too. Benjamin was so in love with this little puddle. No one wanted to leave when it was time to go even though we were all exhausted and slightly sunburned. We seriously need to look into doing more than just a day trip to the beach one of these intercessions. 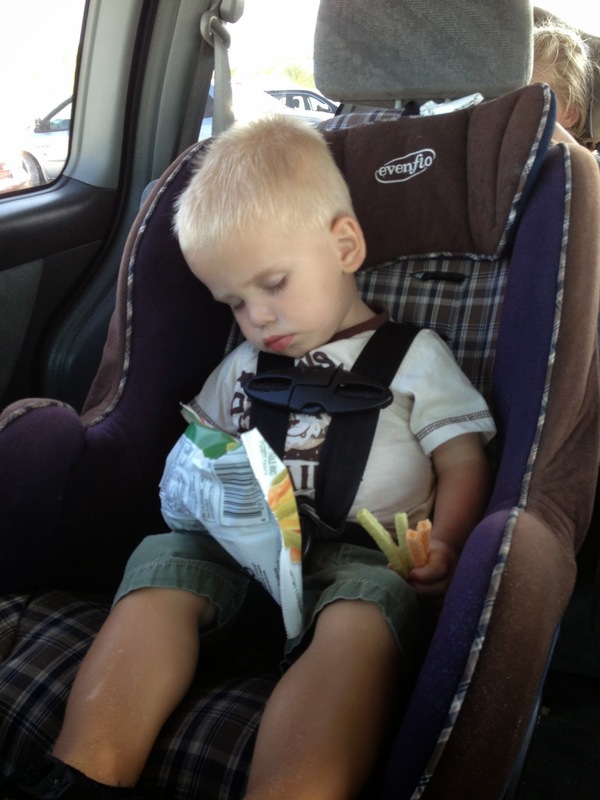 Benjamin fell asleep in the car, clutching a small handful of VeggieStraws, before we even left the parking lot. He unfortunately only slept for ten minutes. We woke him up when we stopped for dinner and he stayed awake for the rest of the trip home, as did his sisters. But he was cute and peaceful for ten minutes, so I suppose we'll just have to take what we can get! What a fun day! I love the swim suits. I have not seen anything quite like them.